Excel includes its most common commands, such as Save and Undo, on the Quick Access Toolbar. Click a toolbar button to choose a command. If you are not sure what a toolbar button does, point to it to display a ScreenTip. 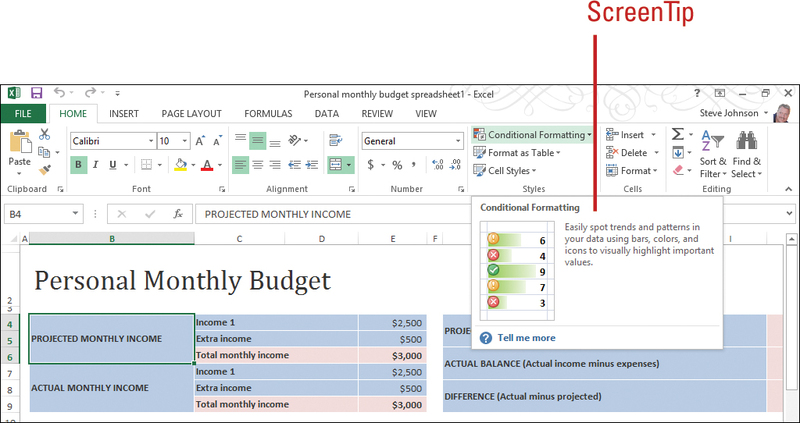 When Excel starts, the Quick Access Toolbar appears at the top of the window, unless you’ve changed your settings. You can customize the Quick Access Toolbar or Ribbon by adding command buttons or groups to it. You can also move the toolbar below or above the Ribbon so it’s right where you need it. 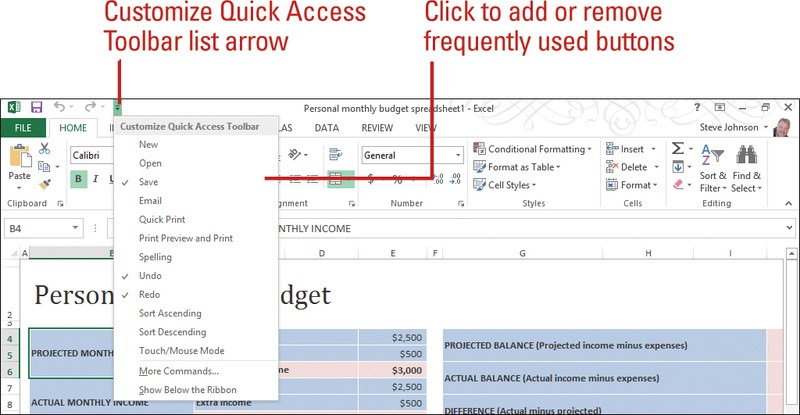 In addition to the Quick Access Toolbar, Excel also displays the Mini-Toolbar when you point to selected text. The Mini-Toolbar appears above the selected text and provides quick access to formatting tools. • Get command help. If you’re not sure what a button does, point to it to display a ScreenTip. If the ScreenTip includes Press F1 for more help, press F1. • Choose a command. Click the button, or button arrow, and then click a command or option. • Add or remove a common button. Click the Customize Quick Access Toolbar list arrow, and then click a button name (checked item appears on the toolbar). • Add a Ribbon button or group. Right-click the button or group name on the Ribbon, and then click Add to Quick Access Toolbar. • Remove a button or group. Right-click the button or group name on the Quick Access Toolbar, and then click Remove from Quick Access Toolbar.